A very special thanks to Kris Allan today for sharing this technique that the cruisers got to enjoy while card-making out on the high seas! 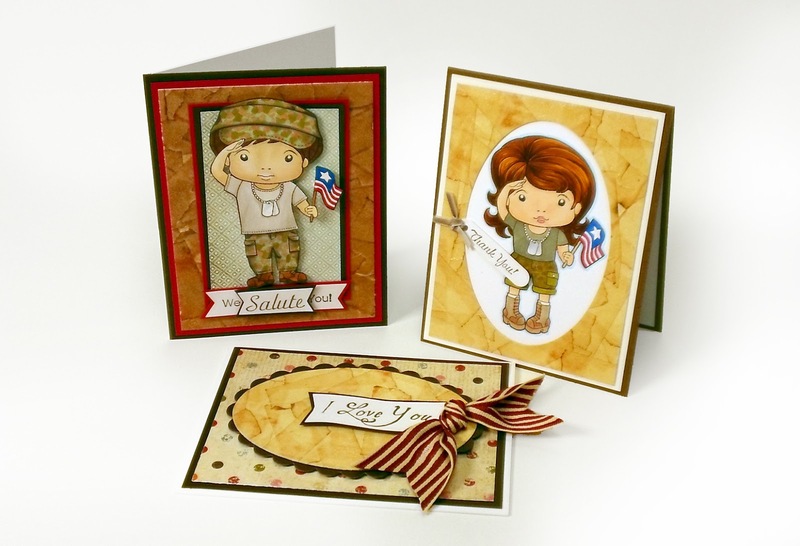 Won't faux leather cards be great to make for Father's Day cards? The deadline for Dad's Day is April 30th! Enjoy this fantastic tutorial! Thanks Sandy, for these faux leather card samples! This is a very simple technique…one that you can do while watching TV, in the car while waiting for your children to finish one of their many activities or while hubby is driving to you to a vacation spot. 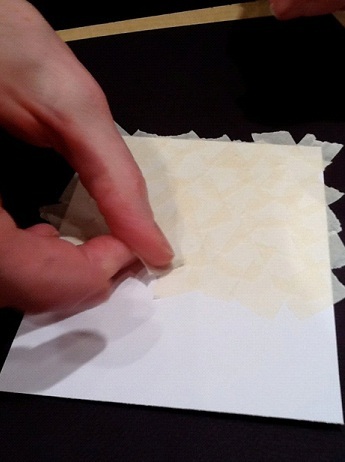 Cut your 8 ½ by 11 cardstock into quarters. You could leave it a full sheet but it would seem like it is taking you forever to cover it with tape so at least in the beginning cut it down. Now take your masking tape and rip off a piece about an inch long. 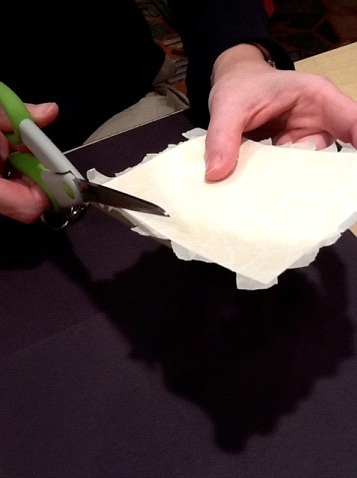 Place down on the cardstock in one corner with some of it off the paper to stick to your work surface. In this picture I have some black cardstock underneath the project so it showed up in the picture. Continue ripping pieces of masking tape and placing on the cardstock. You want the pieces to overlap a bit. Change the direction you place the tape as well. Once you cardstock piece is covered, trim the masking tape hanging over the edges off.Now comes the fun part. 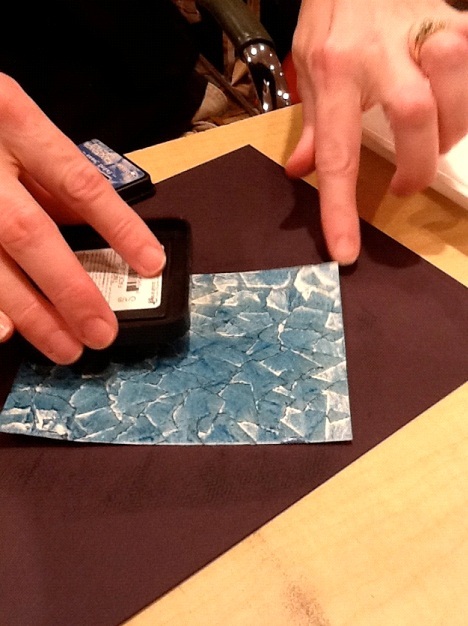 Take your ink in color of your choice and rub it over your tape covered piece. This is where you get to experiment. You can rub on a little bit of color……..
Or a lot of color. If you are daring, try a couple different colors for a rainbow effect. 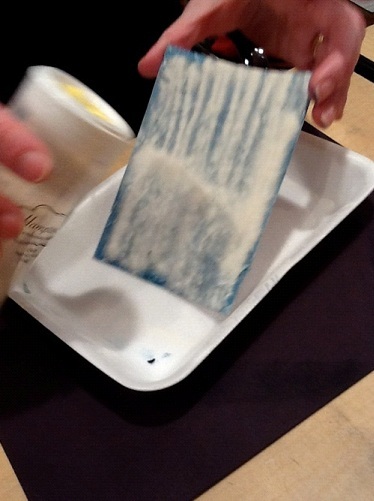 Once you have the amount of ink on that you want, cover the entire piece with clear embossing powder. Because of the tape, the ink will NEVER dry. So you need to set it with embossing powder. 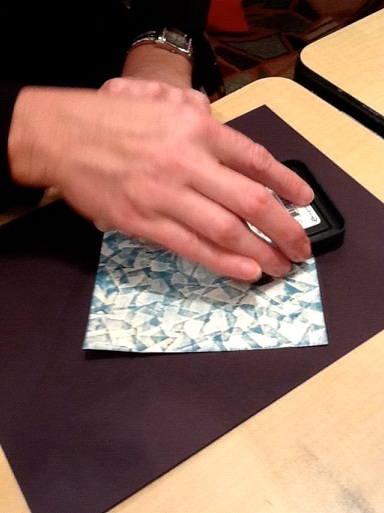 Make sure you cover the ENTIRE piece……now is not the time to be stingy with the embossing powder. On the cruise we used these meat trays (yes they were new and CLEAN!) to catch the excess powder. 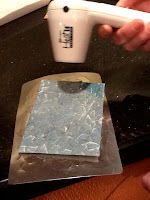 Once you piece is covered, tap to remove the excess powder. 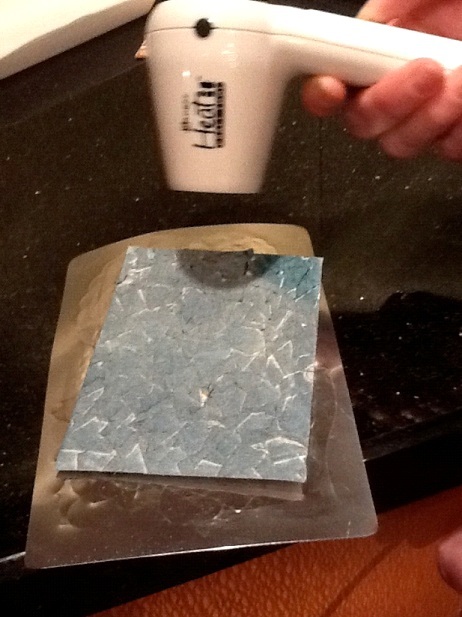 Now it is time to heat up the embossing powder and watch your piece become an interesting piece of faux leather. From this point the possibilities are endless. You can cut this with your nestabilities for layering pieces, cut it down to be a full layering piece on your cardfront, or whatever else you can think of. Try putting your pieces of tape down in different directions. On the cruise, Cindy B. from Michgan (Hi Chicka!) put them down in straight rows with the ends overlapping. Her piece looked like a brick wall to me while to someone else it looked like bamboo. So it is now time to dust off that roll of masking tape that has been hiding in the back of the junk drawer and get to work! Can’t wait to see what you all come up with. Let's see those faux leather cards here! Don't forget to leave a comment for Kris for helping us learn this fun new technique!! Thanks, Kris, for sharing this technique. It looks easy enough for me to try and will be great for masculine and/or Father's Day cards! Oh, can't wait to give it a try! Thanks, Kris! I use to do that on bottles with shoe polish, way back when. What fun it will be to try it on cards. Thanks for sharing. Thanks for sharing Kris. Looks like something I will be trying in the near future. This is cool! Thank you, Kris. I'll have to play with this and try something new! I've done this, but find it very difficult to get the ink to stick to the masking tape. I wonder if they have changed the way they make the tape because my really old roll of tape works great. Margaret....I didn't have any problem with the new roll of tape I used. You do have to press a little harder than when inking up a stamp. It will not stay on the tape unless you emboss. Hope you try it again. Thank you Kris, I am going to try this. It looks fun and I may even get over my fear of the heat gun I bought a year ago and have never used! Thanks Kris for the great idea!!!! Sounds like fun and what a coincidence. I actually am on the way to the store to buy masking tape for another reason. Thanks for sharing, Kris. Thanks Kris! Look forward to trying this today! Look for some cards in our next shipments to you. can you believe I have no tan masking tape in the house - only blue - yikes who would have thought I had to go shopping for masking tape to make a card. Kris -- thanks for showing us this neat technique. I am going to try this tonight and hope to post a card soon. Off to find some masking tape. I'm looking forward to trying this. Thanks Kris! Thanks Kris. I tried it and posted it above. It actually worked for me this time. I think the last time I was not using a direct apply with the ink, but was using a dauber to apply it. Kris, thanks for the great turorial! I am going to give this one a try for sure. I love the tutorials that push the "what if" button!